alaTest has collected and analyzed 14 reviews of Toshiba Excite 13 AT335. The average rating for this product is 3.5/5, compared to an average rating of 4.3/5 for other products in the same category for all reviews. Views about the camera and battery are generally positive. The performance and screen also get good feedback, but the durability and price get less positive opinions. We analyzed user and expert ratings, product age and more factors. Compared to other products in the same category the Toshiba Excite 13 AT335 is awarded an overall alaScore™ of 85/100 = Very good quality. 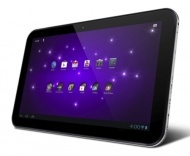 Perhaps one of the most polarizing tablets we've encountered, the Excite 13 is certainly niche. Right for some, totally wrong for everyone else. The Toshiba Excite 13 is the largest Android tablet to date, bringing a whopping 13-inch display to a category ruled by 7-inch and 10-inch tablets. Not everyone is ready for a 13-inch tablet, and not every app is ready for a 13-inch Android tablet.